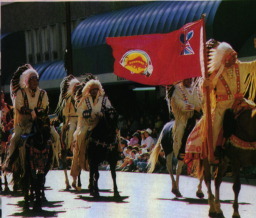 While going through some pages in a in-flight magazine, I discovered an article about Calgary, and in one of the photos of what I believe is the Calgary annual parade (the magazine is in Czech, and my knowledge of Czech is zero), anyway this photo shows five horseman dressed like indians and one is carrying a red flag with some sort of Indian design featuring a buffalo and in the canton is what appears to be a distorted U.J. This flag is perhaps the flag of the Siksika (native people). I don't remember exactly but I believe that the flag was reported by Don Healy. I have the emblem and a note that says that this emblem is on a white flag with a small Union Jack in the canton. The description is according to the image except the colour white, that (according to the image) should be red. Healy's works on the Flags of the Indian Nations shows this as having a white background, with the British Union in the canton and the Tribal Seal as a badge. The photographs posted to the list show a red background and a local variation of the Union flag, cropped, extending upwards to in the form of a teepee, and smaller than a normal Union flag in the canton. The flag in the picture is indeed the official Siksika Nation flag; the men in the picture are of the Siksika First Nation. The buffalo, of course, signifies the importance of the buffalo in our heritage and the seven segments of the arrow symbolizes the seven sacred religious societies. The presence of the tipi in Union Jack colours signifies the Siksika Nations nation-to-nation treaty with the British Crown in Canada.